The Parador de Corias is set in a magnificent monastery founded in 1032 and occupied by Benedictine monks. Known as the Escorial of Asturias, the monastery of San Juan Bautista was one of the richest in the area. Located on the left bank of the River Narcea, it is connected to the village of Corias by a 14th century stone bridge. It was founded in 1032 by Counts Piniolo and Aldonza, and was at the peak of its influence during the 12th and 13th centuries when it acquired land in most of western Asturias and also in the adjacent province of Leon. In 1763 a fire completely destroyed the monastery, with the exception of the church, the sacristy and the library. The remodeling left its most striking mark on the facade. The monastery was rebuilt over the 16th and 17th centuries, but suffered another fire in the 18th century. After that the cloister and the exterior had to be rebuilt. The Corias group is organized around a large rectangle with a central patio in the middle, on the right side there is a church, the sacristy, the dining area and the kitchens. 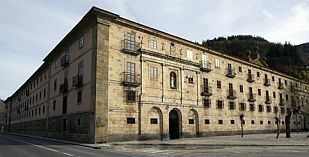 Parador de Corias occupies the whole building of the monastery, the basement has archaeological remains of the old structure and the area became an exhibition space. In Cangas de Narcea, visit the basilica of Santa Maria Magdalena, the palaces of Omana, Los Condes de Toreno, Penalba and Los Sierra. Cangas de Narcea is situated in Muniellos Nature Reserve, designated by UNESCO in 2000 as a biosphere reserve. The main tree species in the Nature Reserve are oak and in the 70's logging was banned and the woods were preserved as a hunting reserve. Hunting was also banned, and human access is now strictly controlled. Wild life includes brown bears (Cantabrian brown bear) and grouse (Cantabrian capercaillie). The local gastronomy is deeply influenced by the climate and geography of the region. The most typical dish is the 'potaje o caldo de berzas' which is prepared with a base of cabbage soup, beans or potatoes. It is served with the 'compango' which consists of meat, traditional sausages, bacon and ham. 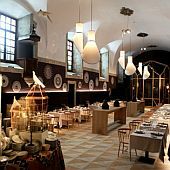 The interior of the monastery has a strong monastic quality, and is also adapted to a modern style, specially in the restaurant, cafe and lounge. Accommodation consists of 40 twin rooms, 29 double rooms, 2 easy access rooms and 5 rooms with living room. The Corias Parador has a restaurant, bar, heated swimming pool, spa, sauna, Turkish Bath , treatment rooms, gymnasium, conference facilities and garage. The Parador's conference rooms are available for all type of events, banquets, presentations and equipped with audiovisual resources. 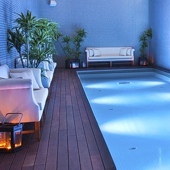 These rooms can also be used in conjunction with the outdoor terraces and two cloisters. Distance from the nearest airport is approximately 107 kms and train station is 90 kms away. Luxury Parador hotel in a eleventh century monastery in Corias Asturias, Spain.